A few days ago we received our early bird LimeSDR unit from CrowdSupply. The LimeSDR is advertised as an RX/TX capable SDR with a 100 kHz – 3.8 GHz frequency range, 12-bit ADC and up to 80 MHz of bandwidth. Back in June 2016 they surpassed their $500k goal, raising over $800k on the crowdfunding site Crowdsupply. Just recently some of the first crowdfunding backers began to receive their units in the mail. We paid $199 USD for an early bird unit, and currently a preorder unit costs $289 USD on Crowd Supply. Inside the shipping box is a smaller black and green box with the LimeSDR itself inside, and a short USB pigtail with extra power header. Note that no pigtails for the u.FL antenna connectors are provided, so you will need to source these yourself, but they can be found quite cheaply on Aliexpress. The PCB itself is intricate and heavily populated with many components. You certainly to feel like you are getting your moneys worth of engineering effort with this SDR. An enclosure is probably highly recommended if you intend to take your LimeSDR out and about, as some of the SMD components look like they could be easily knocked off with a drop. The parcel was declared at the full value, so this may be a problem for those in countries with low customs tax thresholds. For this first initial review we decided to set the LimeSDR up in Windows, with SDR-Console V3, and try to get wideband reception and some simple transmit working. Installation was a bit rocky. Firstly one criticism is that the online documentation is all over the place, and a lot of it seems to be out of date. It was very difficult to find the current USB drivers as many links redirected to the older drivers. Finally we found drivers that work on the Lime Suite page. Secondly there have been some apparent changes with hardware revision 1.4 which is shipping to Crowd Supply backers. This resulted in the current version of SDR-Console V3 being incompatible with the newly shipped boards, and throwing the error “Encountered an improper argument”. We had to search through the LimeSDR forums, and there we found a beta LimeSDR fix version of Console V3 released by Simon. This version worked with our board. Once we had the LimeSDR drivers and SDR-Console V3 installed we decided to update the firmware as we’d seen on the forums that the latest firmware supposedly improved a few things. Again, performing this task was quite confusing as there was several links to outdated documentation and software all over the place. Finally we found what we think is the latest instructions, which had us download Lime Suite which comes together with the PothosSDR software. In this version of Lime Suite there is an automatic firmware update option which downloaded and flashed the new firmware easily. It’s clear that the LimeSDR is very much a development board made mainly for experimenters, but some decent up to date documentation and a quick start guide would help new users tremendously. By browsing the LimeSDR forums we came across a topic where several users had claimed that the LimeSDR v1.4 (the one shipped to CrowdSupply backers) has abysmal HF sensitivity, and poor sensitivity below 700 MHz. It seems that this lack of performance is due to the matching circuit which they have implemented. For better impedance matching at frequencies over 700 MHz they added a parallel 8.2 nH inductor. This unfortunately attenuates HF frequencies severely to the point of no reception, and also other frequencies below 700 MHz to some extent. This is a bit troubling as from the very beginning the LimeSDR has been advertised as working down to 100 kHz. 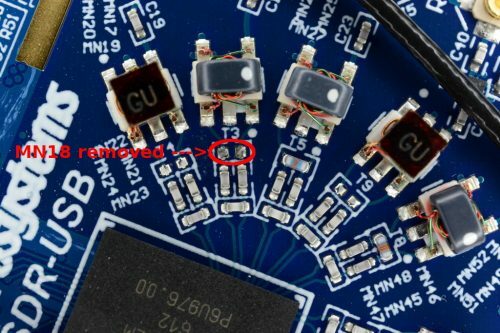 A hardware fix was found by forum user @sdr_research but this only works if you are comfortable taking a soldering iron to the board to remove that inductor. On this official blog post they also mention more fixes (EasyFix1 is the one recommended on the forums) to improve HF performance that include removing more components, and replacing some others. The HF fix for the LimeSDR. Remove this inductor. 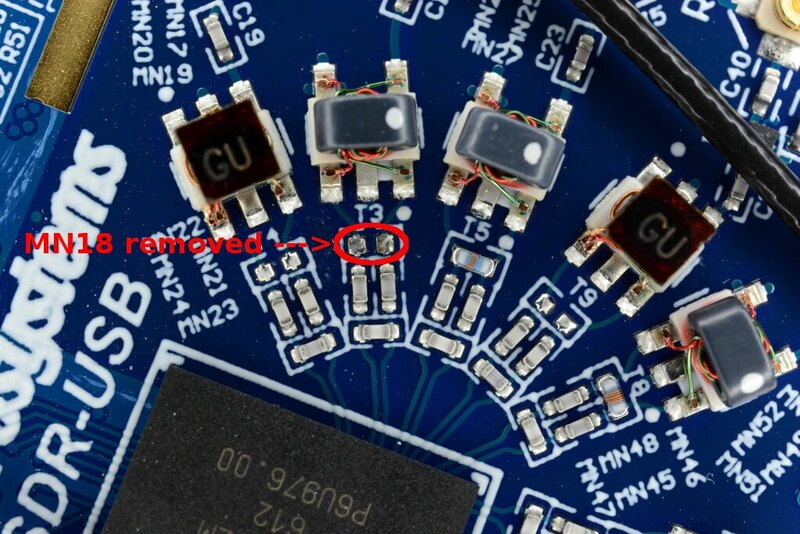 We performed the EasyFix1 mod, which involved removing one inductor on the PCB. Removal was very simple with a soldering iron. Even without a soldering iron it could probably be forcefully removed with some tweezers. After removing that inductor we saw HF spring back into life, with reception working all the way down to the MW broadcast AM band. LF reception still seems to be a bit weak. We were able to receive an NDB down to about 300 kHz, but very weakly in comparison to other SDRs. The image below shows the difference in HF reception before and after the mod. Before and after the mod. Bottom waterfall shows signal levels before the inductor mod, top waterfall shows signal levels after removing the inductor. Fortunately it seems that LimeSDR is trying to make this right, and just today they issued an update that confirms the issue and offers a fix. They are offering an option for unshipped boards to be modified to improve HF performance before they ship out, and a replacement option for those who have already received boards. The deadline for applying for a modification is February 21, 2017. PC Performance: On SDR-Console V3 with a powerful computer running an i7-6700 CPU, Geforce GTX 970 and 32 GB RAM, we were able to run the LimeSDR at up to 65 MHz bandwidth relatively smoothly. SDR-Console V3 takes advantage of Nvidia CUDA processing, so the graphics card may play a large role in the performance that you can achieve at high bandwidths. At 70 and 80 MHz either the software or LimeSDR failed to work properly and everything became choppy and laggy, with a lack of actual reception. On a less powerful laptop with i5 CPU, built in ATI graphics chip and only 4GB of RAM the LimeSDR ran okay up until about 20 MHz. Sensitivity: Sensitivity seems to be comparable to other SDRs all over the band. We also tested L-band Inmarsat reception and this seems to be pretty good even without an external LNA, but adding an external LNA still helps. See the differences in the image slider below. Once the HF mod was performed HF sensitivity seems to be very good. Dynamic Range: The dynamic range of the LimeSDR seems to be quite good with its 12-bit ADC. On Broadcast AM and some very strong trunking signals at 410 MHz we observed no overloading. In the future we will do some further tests in an environment with very strong BCFM and DVB-T signals,. Sampling Rate Issues: The LimeSDR doesn’t seem to always work well at lower sampling rates. Usually at lower sampling rates the sensitivity appears to be very poor. Generally we stuck to 20 MHz and used the zoom in SDR-Console V3 where necessary. This is probably just a software bug. Spurs: With the antenna disconnected there are a lot of spurs and areas of large interference visible all across the spectrum. Other Notes: The LimeSDR PCB gets extremely hot and cannot be touched easily without finger burn after a few minutes of operation. Some sort of enclosure seems necessary. Also as this is a USB 3.0 device long USB extension cables don’t work, and USB 2.0 active cables certainly don’t. The LimeSDR seemed to work okay with a thick 2M extension cable, but failed to run properly with a thin 3M one. Using Jiang Wei’s foo_limesdr plugin for the Windows foobar2000 music player we were able to instantly get going with transmitting a WFM music signal. The plugin also supports FM and AM transmissions. Transmission was quite strong and even without an antenna connected the signal was heard with an RX antenna placed a few meters away. It could be possible to get into trouble with signal strength levels and interference with this, so take care as to what and where (frequency and location) you transmit. TXing with the LimeSDR with foo_limsdr. RXing the signal with an RTL-SDR. The LimeSDR seems to have had a few launch problems but this is probably why they are rolling the boards out slowly, so that any issues can be fixed quickly without affecting too many customers. Crowd funded products normally have some issues upon launch so this is not uncommon and is a part of the risk you take when participating in crowd funding. In the end the LimeSDR problems seem to be getting resolved to most peoples satisfaction. Other than that, the LimeSDR seems to be working well. With a little more polish it should turn out to be an excellent SDR. But those who haven’t purchased yet might want to hold off until the SDR matures a bit further. It also seems that they may already be working on the next LimeSDR version so it may be wise to hold off until there is some certainty as to what their future plan is. Also, early in the crowdfunding campaign one of the main selling points was that there was going to be an ‘App store’ for the LimeSDR where one could download an application and have it run just like that. So far this doesn’t seem to be ready yet, but it does appear that they are still working on it. I have got my LimeSDR two weeks before. Since that time, I have got no answers of my question. I use the LimeSDR ( v1.4s ) with the SDRConsoleV3. and RX2 ( H , L , W ) ? In the SDRConsoleV3 — Home — RX Antenna , I can only switch between None , H , L , W but always the connectors RX1_H , RX1_L and RX1_W are connected. How can I switch to RX2_H , RX2_L and RX2_W ? I think, it must be possible to use all Coaxial RF ( U.FL ) Connectors. A second point, I have found today, is the Transmit-Window, it is inactive, it is grey. How can I activate it to use this part of LimeSDR ? The LimeSDR PCB gets extremely hot and cannot be touched easily without finger burn after a few minutes of operation. Some sort of enclosure seems necessary. What would be the best way to keep this thing cool? Fan? Heatsinks? Other? I asked the Lime team if the second RX channel will be fixed to get HF on RX2_L input the same way as RX1_L and it was replyed me it will not be the case. Be aware HF will only be avaliable on the 1sr RX channel. RX2_L is then useless because, higher frequencies are already avaliable on the other inputs (each chyanne has actuall 3: RX_L or low freq, RX_W for wide band and RX_H for Highest freq). They provide a quick mod witch is half of the actual fix, I’m very disappointed. There’s no difference between RX1_L or RX1_W to RX2_L and RX2_W – they are designed the same and can be modified the same, too. Thanks for the analysis there. I had a suspicion that was probably the case; personally I think I will keep one channel unmodified. I fully agree, a few meter range for WFM is interference of several or many or more km/miles, when reception of very weak signals are involved!!! If you want to show, that FM-Stereo works, please choose a badn appropiate band 88 -108 MHz where the impact of unintentional radiation interference is less damaging if others are tempted to reproduce the seen frequency. Sorry I can’t seem to get to use the HTML tags correctly. PS: On second thought, since most SDTRx are unshielded and therefore do generate signals and will radiate quite a bit, why not add a bit more information for readers whenever SDTRx are concerned. Unforunately from ITU Radio Regulations down to national frequency allocations it is complicated/confusing. Band use and allocation to services/use may vary from ITU region to region, again within a region, than again e.g.CEPT in Europe, and from country to country. Penealties and how strictly they are enforced will vary from country to country too. A slap on the wrist in one country can get you a hefty fine and/or jail in another, if you transmitt with your SDTrx in another country. True — I think AirSpy will still most likely be the gold-standard for inexpensive receivers. The AirSpy Mini is the only dongle I own that doesn’t have an absurd number of spurs, although to be fair I haven’t really had time to evaluate the RTL-SDR.com v3 (which I hear is pretty well-behaved). HOWEVER, I think the appropriate point of comparison for this device is HackRF. If LimeSDR has better performance than HackRF, I will not feel cheated (especially given that, at least with early bird pricing, I paid less for it than the regular price of HackRF — $200-ish vs. $300-ish). I did get a prompt response from LimeSDR; the short answer is it doesn’t violate the warranty because there is no warranty (beyond “it will work upon delivery”). I’m cool with that personally, but just wanted to throw that out there. use a hot air gun, its not so easy to remove a 0402 part with a solder iron… dont damage the pad, because there is a thin feed trace…. They may wish that was true, but from a legal standpoint, it is not the case. When the price is low that argument may work, but as the price increases it is simply no longer true at least within the UK and most of the EU. Hello admin! 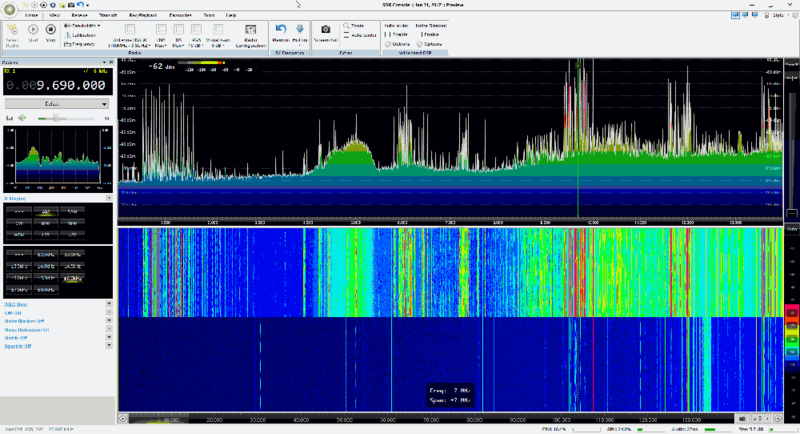 Any comment about the limesdr performance against airspy? LimeSDR won’t beat the Airspy for RX cleanliness. But it’s difficult to compare the two because the LimeSDR is more of a ‘does it all’ device (RX/TX, massive freq range, super wide bandwidth), rather than a specialist RX device. Is the factory mod the same as EasyFix1? I’m not sure if I want to wait six weeks when I can remove a single inductor myself. If on the other hand they’re doing a more extensive mod (perhaps the one involving replacing components) then I might be willing to wait six more weeks, if the improvement in performance over EasyFix1 is non-trivial. Nevermind, I went back and re-read the CrowdSupply update carefully and they make it clear that the modification is EasyFix1. Reading is fun-damental! My conclusion is that only people who have a deep-seated fear of soldering irons and/or tweezers would be benefited by filling out the form to request factory modification (And also maybe anyone who bought LimeSDR in bulk). WITH ONE IMPORTANT CAVEAT, to wit, will those of us who modify the boards ourselves void the warranty by doing so? With a diode and a spare GPIO pin, they could switch the inductor in or out of the signal path to allow HF while giving better performance above 700 Mhz. Worst method ever. At least one “small insertion loss, small distortion” transistor is required to properly bypass the inductor. Given that the value of the inductor is 8.2 nH, I’d also wonder if it’s even possible to switch it without introducing some significant parasitic inductance that throws the whole thing out of whack. Just a couple of centimeters of bare round copper wire would have a self-inductance around this value. To be sure, I am not particularly knowledgeable as to how to handle small inductances/capacitances in practical electronics. So maybe this is a non-issue for a competent hardware engineer. IMO they should include a software-switchable impedance matching network into the v2 of their LimeSDR board. Then their claim of 100kHz to 3.8GHz would be truly satisfied. I wouldn’t care if they uses PIN diodes or RF MOSFET’s or topological insulators to accomplish that switching.